A retrospective of the work of Turner Prize-winning artist Rachel Whiteread at London's Tate Britain includes life-sized casts of a staircase and a chicken shed. Whiteread, who won the Turner Prize in 1993, specialises in sculpture using materials such as plaster, concrete, resin, rubber and metal to cast everyday architectural and domestic forms. The exhibition includes some of the artist's earliest pieces exhibited at her first solo show in 1988, as well as never-before-seen pieces from this year. One of these newly revealed works has been created specifically for the exhibition and installed in the gallery grounds to signpost the show, which continues until 21 January 2018. The piece titled Chicken Shed is a large concrete cast of a chicken shed owned by the artist's friend in Norfolk. The work follows a recent series by Whiteread that she calls Shy Sculptures. These are cast-concrete cabins, huts or sheds placed in secluded locations that require significant journeys to be reached, such as by a fjord in Gran, Norway, or in California's Mojave desert. One of the main features of the exhibition is Whiteread's Untitled (One Hundred Spaces) installation, which was originally created in 1995. The work comprises 100 coloured resin casts of the underside of found chairs, and occupies the south side of the Tate Britain’s Duveen gallery. This same space was used to host Cerith Wyn Evans' neon lighting installation in an exhibition that took place earlier this year. Whiteread also selected a number of sculptures from the Tate's collection to sit alongside her work, including pieces by British artists Barbara Hepworth and Sarah Lucas. Another of the works on display is Whiteread's Untitled (Room 101) from 2003 – a cast of a room located in the BBC’s Broadcasting House believed to be the inspiration for Room 101 in George Orwell's renowned dystopian novel, 1984. As well as a range of casts of smaller, domestic objects like tables, boxes and hot water bottles that are on display, the exhibition also includes documentation and archive material of some of Whitread's larger scale public projects that are no longer available to view. One such work from 1993, House, was an in-situ life-sized cast of the interior of a condemned terrace house in London's East End. The work stood for a mere 11 weeks before its controversial demolition, but it cemented Whiteread's reputation as one of Britain's leading contemporary artists and she was awarded the Turner Prize the same year. 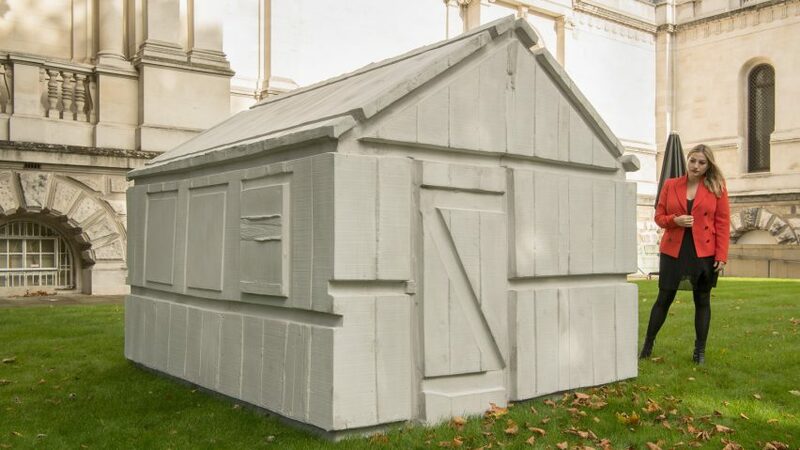 "It has come to epitomise Whiteread's lifelong project as an artist," said a statement from Tate Britian, "fusing everyday architectural and domestic forms with personal and universal human experiences and memories."